The educational campaign about the importance of preservation and improvement of women’s health had been successfully implemented during the period January-March 2014 in Bujanovac, Preševo and Vranje with financial support from the European Union and the Government of Switzerland through the European Partnership with Municipalities Programme EU PROGRES. More than 1,200 inhabitants from these municipalities in the South Serbia, among which had been the large number of high school students, were involved in the street events and conferences where they learned about the importance of the regular medical check-ups. 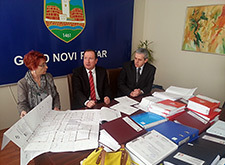 The technical documentation for the construction of five important buildings in Novi Pazar, developed with the financial support of the European Union and the Government of Switzerland through the European Partnership with Municipalities Programme EU PROGRES, was handed over today to the local government representatives. The Ambassador of Switzerland to the Republic of Serbia Jean-Daniel Ruch visited today the outpatient maternity ward in Preševo that was equipped with the funds from the European Union and the Government of Switzerland through the European Partnership with Municipalities Programme EU PROGRES. 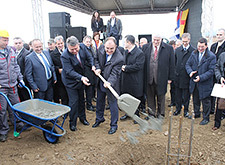 The detailed regulation plan of ‘Bunuševac’ Industrial Zone in Vranje, funded by the European Union and the Government of Switzerland through the EU PROGRES European Partnership with Municipalities Programme, was one of the major preconditions for the Italian company Geox to initiate construction of the footwear production plant employing 1,250 workers.